Pink agate gemstones, pink agate benefits: pink agate stone is partially translucent with opaque pink and cream flecks, swirls or banding....Therefore, there are many agate [varieties". METAPHYSICAL: It is said to be a grounding stone that brings balance emotionally, physically and intellectually; harmonizing the Yin and Yang. The power of agate gemstone to the ancient Chinese was more internal. They believed that agate crystal meaning was one of spiritual protection, and could stimulate one's life force while cleansing their mind to make space for good luck and fortune. 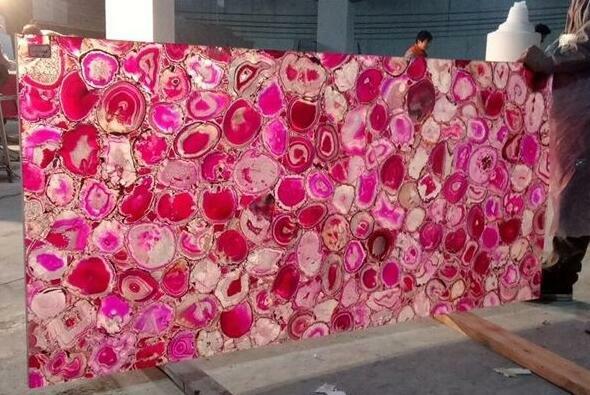 Agate stone slabs series – Pink agate slab, surface finish is polished, we offer many kinds of colors: green, grey ,yellow, red, purple ect. Slab size normally 240*120*2cm,thickness is 2cm (normally 0.5cm pink agate +1.5cm natural commercial stone or artificial stone/glass/Acrylic); max size can be 300*180cm.Mainly being applicated like wall tiles, floor tiles, table top, countertop-..